The 2018 NABOS Expedition aboard the R/V Akademik Tryoshnikov was carried out under the auspices of the NABOS scientific project, bringing together international research institutions and research programs. The exceptional magnitude of recent high-latitude changes in the ocean, ice, and atmosphere strongly suggests a potentially irreversible shift in the Arctic Ocean to a new climate state. These changes have important implications for the Arctic Ocean’s marine ecosystem—especially for those components that depend on sea ice or that have temperature- and stratification-dependent sensitivities or thresholds. Addressing these and other questions requires careful observations. To these ends, this expedition will provide key information about the historical transitions occurring in the Arctic Ocean. Planned route and activities for the 2018 NABOS cruise, starting 8 August. 2010–11 was not a simple period for our program. Funding was discontinued, impacting our ability to continue annual cruises and to extend our vital observations at the key locations of the Arctic Ocean. Despite these problems, we continue our analysis of NABOS/CABOS observations, which have resulted in a series of important publications in the top scientific journals. NABOS observations have been used in multidisciplinary studies, and have led to ~50 published and submitted papers. Observational data collected under NABOS’ auspices have been in great demand. For example, researchers from 57 institutions in 11 countries have visited the NABOS data portal; 15 institutions have been added to this list during the last year alone. NOAA’s National Ocean Data Center added NABOS data to the publicly-available World Ocean Database archive. We have received numerous requests for data for validation of ocean models and data assimilation, and we have provided NABOS data to many individuals upon request. This high demand for NABOS data demonstrates the utility of this program. Moreover, thanks to our friends and colleagues from the Norwegian Polar Institute (Norway), Alfred Wegener Institute (Germany) and Institute of Ocean Sciences (Canada) we successfully recovered several NABOS and CABOS moorings, which have provided a wealth of observational data. Map with satellite sea ice data taken on September 9, 2007. 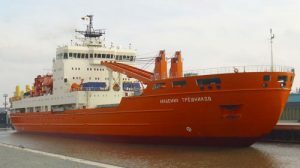 Due to difficulties with chartering a Russian icebreaker, the 2007 NABOS cruise used the smaller research vessel Viktor Buynitsky this year. The Viktor Buynitsky is from the Murmansk Branch of the Russian HydroMeteorological Service. Since an icebreaker was not available, it was necessary to make changes to the cruise schedule and track. To accomplish this, the cruise was split into two legs. The first half took place in the Laptev and East Siberian Seas and included mooring recovery and deployment and oceanographic observations. The ship then returned to Longyearbyen, Svalbard to pick up more scientific equipment and personnel and the voyage continued to the Barents Sea for mooring work and other measurements. Researchers from Canada, Norway, Russia, and the United States participated in NABOS-CABOS research cruises in the Arctic Ocean. Additionally, Japan and Germany are collaborating on the project. This effort contributes to the comprehensive study of the Arctic as part of the world climate system. The overall purpose of the observational program is to provide a quantitative, observationally based assessment of circulation, water mass transformation, and their mechanisms in the Arctic Ocean. The 2003 NABOS cruise aboard the icebreaker Kapitan Dranitsyn took place in August-September 2003. It was the second NABOS expedition. The overarching goal of the 2003 field program was to characterize the oceanographic, ice, and biological conditions in the northern part of the Laptev Sea in 2003. In addition, moorings were deployed and recovered. Figure 3. Canadian Basin, with locations of MMP 2001 and MMP 2002. The first logical step to initiate the observational program was a Pilot Project initiated in the summer of 2002, which tested the international connections and provided necessary experience for the full-scale field program. As an initial stage of the NABOS/CABOS, the Pilot Project had several goals. The Pilot Project provided preliminary information about circulation and water mass transformation at several locations of the Eurasian Basin (Fig. 2) and Canadian Basin (Fig. 3). It tested international connections and provided necessary experience for the full-scale field program. We used the Pilot Program to establish channels for getting Russian permits and customs arrangements. During the Pilot Project the core team of scientists and technicians were assembled. In summer 2002 we deployed two NABOS moorings and one CABOS mooring off Banks Island (northern mooring marked as MMP-2002, Fig. 3) for one year. 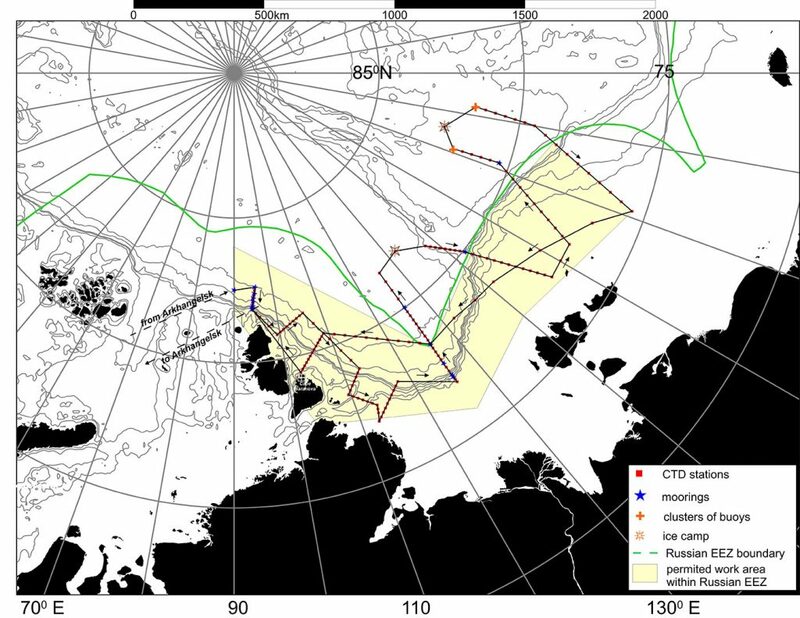 We established permission from the Russian authorities for CTD surveys in Russian EEZ northward of the Laptev Sea during our NABOS summer cruise (the NABOS moorings deployed in the summer of 2002 were outside of the Russian EEZ and did not require permission). The Russian icebreaker Kapitan Dranitsyn was used in the NABOS cruise. The Canadian icebreaker Louis S. St.-Laurent deployed our CABOS mooring. This icebreaker was also used to recover the first IARC mooring, which was deployed in the summer of 2001 in the Beaufort Sea (southern mooring marked as MMP-2001, Fig. 3) as a prototype for future moorings.